The high value of sports stars’ images as bankable intellectual property has been underlined by a decision by Madame Tussauds in London to spend £150,000 on a waxwork of Cristiano Ronaldo – to go on display a full year after he left British shores to sign for Real Madrid from Manchester United. Tussauds will display the new creation to coincide with this summer’s World Cup, but Ronaldo has been in demand for years, and remains so, according to a spokesman. Visitors are canvassed on leaving the London attraction about who they would like to see immortalised in wax. “For the last three years consecutively, Ronaldo has been the most requested figure at the attraction,” the spokesman said. Ronaldo’s waxwork will join images of his former United team-mates David Beckham and Wayne Rooney, as well as those of Pele and other sports stars including Lewis Hamilton, Sachin Tendulkar and Jonny Wilkinson in the attraction’s interactive Sports Zone. Ronaldo’s figure will be kitted out in Portugal international gear, donated by the player himself, who receives no fee for having his image used. 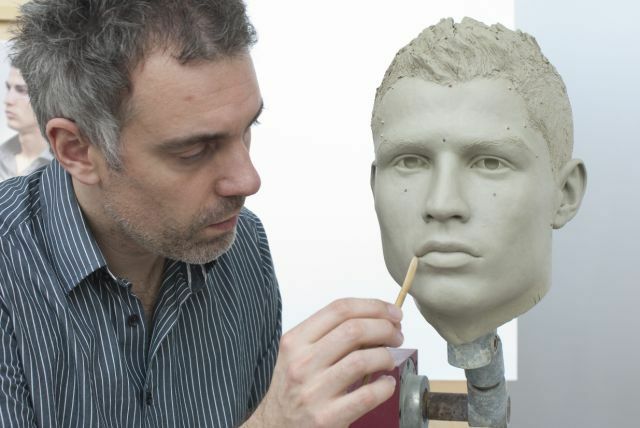 The winger attended a sitting with Madame Tussauds sculptors at the Real Madrid training ground back in December where the team took over 300 precise measurements and a catalogue of reference photographs to work with. The figure will take four months to create and will cost £150,000.